Accounting, engineering, medical, technology, and creative industries are just a few examples of industries that staffing agencies specialize in. This kind of specialized staffing agency can streamline your hiring process by providing a great combination of expertise and networking power. Specialized staffing agencies know your industry, and can provide you with a great fit for your specific need from within their impressive networks. Speaking of networks, staffing agencies often have access to a great network of candidates in your field. Staffing agencies work with many more job seekers per year than any ordinary human resources department, and so have access to a much larger pool of pre-screened job applicants. Specialized staffing agencies have the added advantage of a network filled with professionals in your specific field. Staffing agencies can provide temporary employees for your company. They can also provide temp-to-hire positions which can improve your hiring process by increasing employee retention. Employees and employers get to “try each other out” in a temp-to-hire situation. So, if you actually end up hiring an employee full-time, that employee is more likely to stay with your company for longer. This can save your company a lot of money. Staffing agencies often provide their (your) employees with benefits like health insurance and retirement plans, after employees have been with the staffing agency for a while. This means that you don’t have to, which allows you to hire top talent without worrying about added costs to your company benefit plans. Staffing agencies also often take care of the employer’s share of FICA taxes, Medicare, and payroll taxes. While staffing agencies do charge a fee—usually tied to the salary of the employee(s) from the agency that work for your company—that cost can actually be less than the price of a traditional hiring process. Staffing agencies take care of sorting through resumes, interviewing, benefits administration, and managing payroll for your temporary employees. This saves the human resources department valuable time and money. Moreover, temp-to-hire situations reduce the likelihood of a costly bad hire. What questions do you have about staffing agencies? 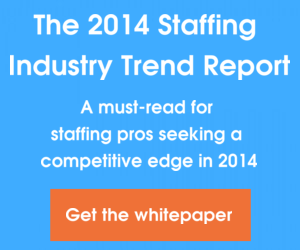 Have you used a staffing agency as part of your hiring process? Tell us about your experiences below.